The U.S. Open King Mackerel Tournament began forty years ago, when a small group of community leaders met and decided that they needed an event to showcase the great fall fishing in the Southport-Oak Island area. Today, the U.S. Open King Mackerel Tournament attracts 400 boats annually and is one of the largest kingfish tournaments on the east coast. The tournament has a guaranteed prize structure and in 2018, paid out over $273,000 in cash. 2018 1st Place Winner--Captain Dieter Cardwell and crew members Mike Lundy, Mike Lundy, Kevin Alley, Jr. Angler Alex Ferm, and Ole Fermaboard aboard "Tide Line" on their win of the 2018 U.S. Open King Mackerel Tournament with a 37.20 pound king mackerel for a total cash prize of $108,216. The official dates of the 2019 tournament are October 3rd - October 5th at the Southport Marina. 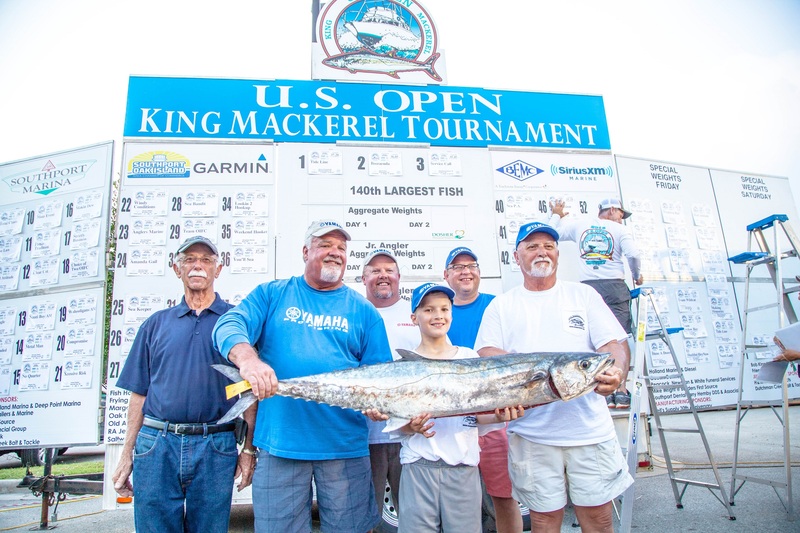 For information about the tournament or for sponsorship information visit the Tournament website at www.usopenkmt.com, on Facebook or contact the U.S. Open King Mackerel Tournament, 4433 Long Beach Road, SE, Southport, NC 28461. Phone 910.457-5787 or e-mail us at events@southport-oakisland.com.